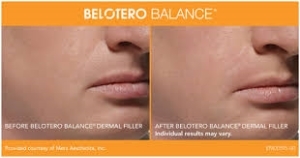 Belotero is an FDA-approved, injectable filler that is used to smooth out folds and wrinkles as well as increase lip volume. It integrates directly into the facial tissue, binding to water molecules for a smooth, natural look. It is an excellent option for treating the delicate areas, such as smile-lines around the mouth. The result is instantaneous and will give you long-lasting natural enhancement. Areas Treated - Cheeks, nasolabial folds, marionette lines, chin, and lips. 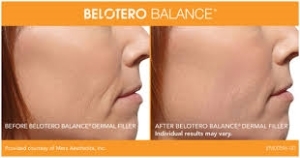 Results - The appearance of wrinkles and facial folds are smoothed by adding structure and volume underneath and bringing creases back up to the surface. The skin will remain flexible and soft. 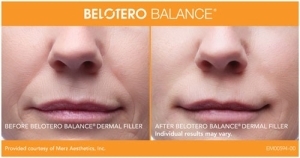 Treatment Interval - Results typically last 6-9 months, after which there is a gradual diminishment of the filler. Treatment Time - 30 minutes. Recovery Time - Immediately after the treatment, there may be temporary swelling or redness for the first day. As with any injectable filler, there is a chance of bruising, particularly in individuals taking aspirin or other medications that may thin the blood. This typically resolves in less than one week. Your nurse or physician injector can educate you on ways to avoid or decrease the likelihood of this happening. Contact us online for a free consultation with one of our cosmetic nurse specialists*. There is a fee for all appointments with our doctors, we accept most major PPO insurances for medical visits.